WASHINGTON, D.C. — NASA’s leaders put out their pitch today for commercial ventures to build the hardware needed to put American astronauts back on the moon by 2028. The mission architecture represents a dramatic shift from the way NASA put humans on the moon 50 years ago. As laid out in a document known as a Broad Agency Announcement, the procurement plan calls for commercial ventures to propose concepts for a descent module, a space refueling system and a transfer vehicle by March 25, a little more than a month from now. Several companies would be selected in May for an initial six-month phase of study and development, with up to $9 million paid out to each company. 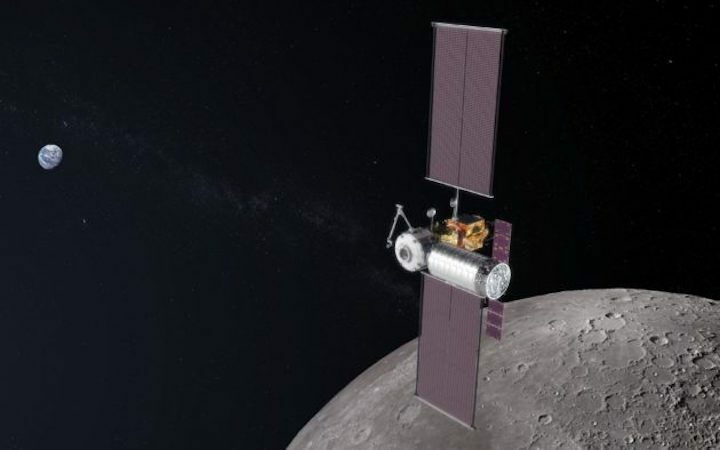 Based on the progress made during that first phase, as many as two companies would be chosen to build hardware for a series of demonstration missions. Those companies could be in line to receive hundreds of millions of dollars in NASA funding. The idea takes its inspiration from the Commercial Orbital Transportation Services program, or COTS, which supported the development of SpaceX’s Dragonand Northrop Grumman’s Cygnus spacecraft for space station resupply years ago. “COTS is the model,” Bridenstine told GeekWire. NASA says the companies would be required to cover at least 10 to 20 percent of the development costs, depending on the size of the company. “We look for proposers to have some skin in the game,” Nantel Suzuki, a NASA program executive, told industry representatives. 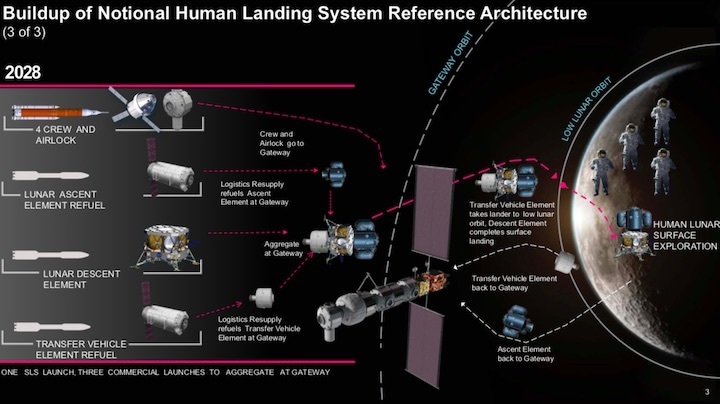 Hardware would be launched aboard commercial rockets and NASA’s yet-to-be-built Space Launch System to the Gateway space platform, which NASA and its international partners plan to build in lunar orbit during the early 2020s. 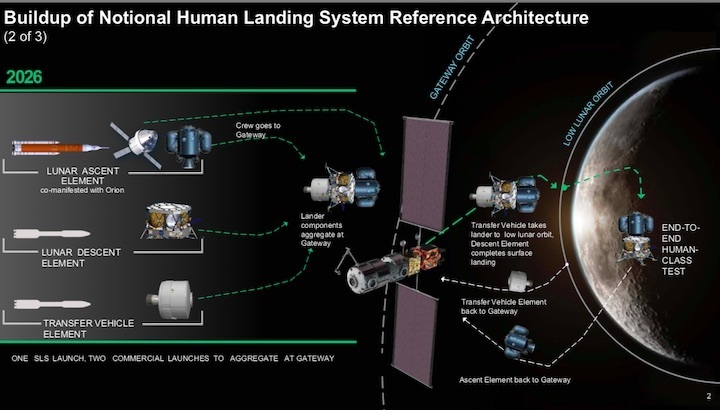 The first demonstration mission, scheduled for 2024, would involve sending down an uncrewed descent module from the Gateway to the lunar surface. The second mission, set for 2026, would be an uncrewed demonstration of the descent module, plus an ascent module to get back from the moon to the Gateway. The mission would use a separate transfer vehicle to ferry the spacecraft from the Gateway to a staging orbit about 100 kilometers (62 miles) above the lunar surface. Both the ascent module and the transfer vehicle would be refuelable and reusable. 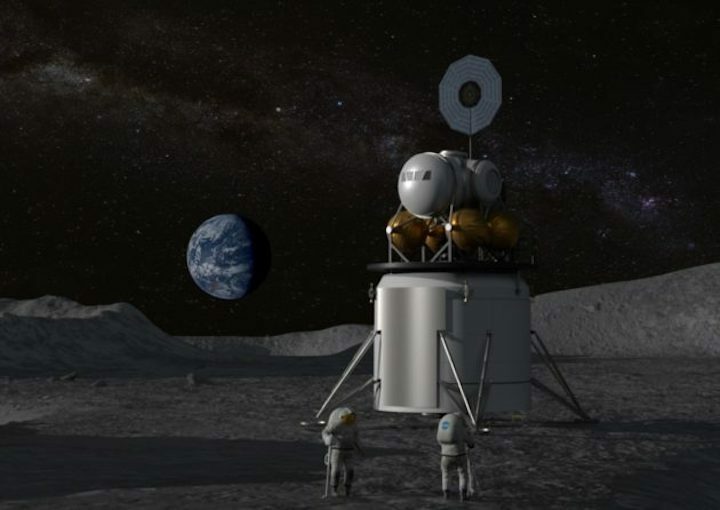 Astronauts would make their first trip to the lunar surface in 2028, using the same three-element infrastructure that was tested without a crew in 2026. NASA’s plan calls for as many as four astronauts to spend as long as seven days on the moon during each mission. The system could support surface operations that include human settlements as well as fuel production facilities that take advantage of the moon’s reserves of frozen water, and could serve as a model for farther frontiers. 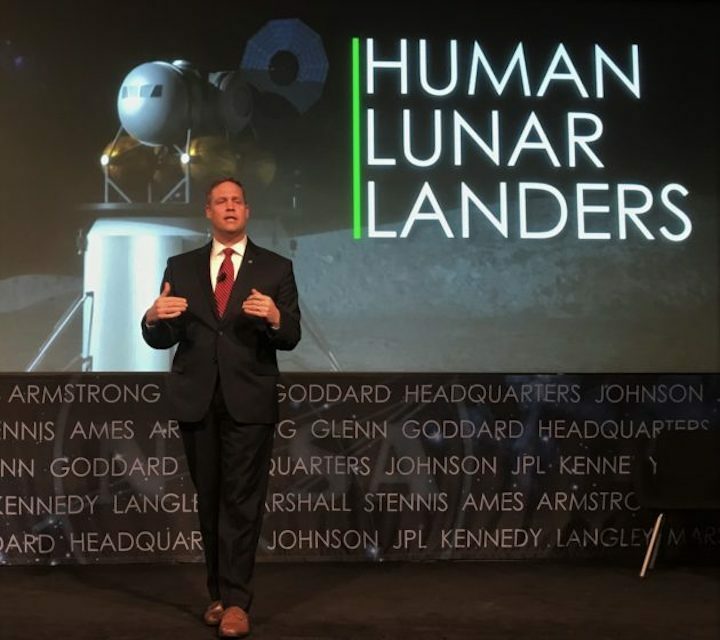 “We’re going to retire risk, we’re going to improve technology, and then we’re going to take as much of this as possible and replicate it at Mars,” Bridenstine said. As it stands, the architecture meshes well with concepts such as the Blue Moon lander being developed by Amazon billionaire Jeff Bezos’ Blue Origin space venture. Blue Origin executives have said Blue Moon could be ready for flight by around 2023 if NASA provides support — which matches NASA’s timeline. In contrast, the architecture doesn’t match up that well with SpaceX’s plan to build a Starship spaceship that’s designed to bypass the Gateway and fly directly to the lunar surface — or to the surface of Mars, for that matter. SpaceX’s billionaire founder, Elon Musk, has said Starship could be ready for trips around the moon and journeys to Mars by the mid-2020s. But as it stands, Starship doesn’t fit the specifications laid out in the Broad Agency Announcement. Bridenstine said NASA wants to move forward quickly with the architecture that it’s spent years developing. In the nearer term, NASA is also moving forward with a program aimed at purchasing lunar delivery services for scientific payloads. Thomas Zurbuchen, NASA’s associate administrator for science, told journalists that he expected the first payload delivery order to be issued in about a month. “That’s a big deal,” Bridenstine said. Next week, NASA is due to list 12 payloads it’ll want delivered to the lunar surface. 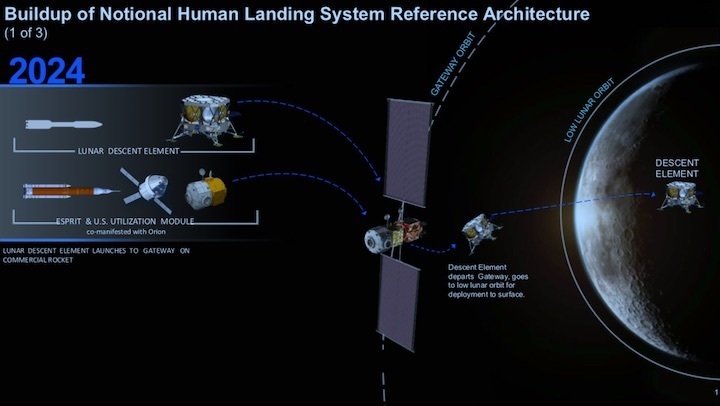 Zurbuchen provided a sneak preview, saying that the payloads being readied by NASA centers would focus on scientific areas ranging from resource prospecting on the moon to stereo imaging for landing systems. Commercial ventures are being invited to propose lunar payloads as well. When it’s time to decide on delivery, NASA will choose from a “catalog” of nine commercial vendors that includes established players such as Lockheed Martin as well as startups such as Astrobotic and Moon Express. And in line with NASA’s heightened emphasis on fast moves to the moon, Zurbuchen said there’ll be incentives for vendors who can get payloads launched sooner rather than later. “If we had any wish, we would like to fly this calendar year,” he said.